Stresseraser. Leer ontspannen met een klinisch bewezen methode. 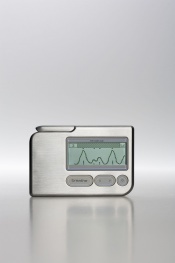 Leer te ontspannen met de klinisch bewezen StressEraser biofeedback. Geen medicatie. Geen computers. Geen kabels of banden. Zo natuurlijk als ademhalen. "Ik vind de feedback functie, de eenvoud en het gebruiksgemak van de StressEraser bijzonder plezierig. We hebben de StressEraser gebruikt in verschillende studies met groepen en individuen en hebben goede resultaten in de behandeling van stress, depressie en trauma symptomen behaald, vooral wanneer de StressEraser wordt gecombineerd met andere op empirisch bewijs gebaseerde behandelingen." "Mijn clienten zijn zeer enthousiast en vinden hun "hartmobieltje" praktisch. Ze voelen zich binnen enkele weken al een stuk beter en gelukkiger"
medisch fysicus, expert in hartcoherentie en eigenaar van hartfocus. Dr. Buysse is a Professor of Psychiatry at the University of Pittsburgh School of Medicine. He received board certification from the American Board of Psychiatry and Neurology and the American Board of Sleep Medicine. He is Program Director of the Sleep Evaluation Center and the Clinical Neuroscience Research Center, a satellite of the University of Pittsburgh General Clinical Research Center. Dr. Buysse is past president of the American Academy of Sleep Medicine, the largest professional organization representing sleep medicine clinicians and researchers. He has written for more than 150 peer-reviewed publications and 68 invited publications on clinical sleep research topics. He is a Deputy Editor for the journals Sleep and The Journal of Clinical Sleep Medicine. Dr. Buysse's research interests focus on the assessment, pathophysiology, and treatment of insomnia. Dr. Gevirtz is a Distinguished Professor of Psychology at the California School of Professional Psychology at Alliant International University in San Diego and the Research Director of the Pain Research Center at Sharp Hospital. He is the President of the Association for Applied Psychophysiology and Biofeedback and the past President of the International Society for the Advancement of Respiratory Psychophysiology (ISARP). He is the author of numerous publications on the psychophysiological mechanisms and treatment using heart rate biofeedback, respiratory retraining, and cognitive behavioral therapies of disorders affected of the autonomic nervous system, such as IBS, non-cardiac chest pain, TMD, and headache. Dr. Gevirtz is Associate Editor of Applied Psychophysiology and Biofeedback and a reviewer for various scientific journals including Psychosomatic Medicine and Biological Psychiatry. Dr. Hollander is the Esther and Joseph Klingenstein Professor and Chair of Psychiatry at the Mount Sinai School of Medicine in New York City. He is also Director of the Seaver and Greater New York Autism Center of Excellence, also at the Mount Sinai School of Medicine. He is involved in research on the neuropharmacology, neuropsychiatry, functional imaging, and treatment of obsessive-compulsive disorder, impulsive/ aggressive personality disorders, obsessive-compulsive-related disorders such as body dysmorphic disorder, pathological gambling, and autism. Dr. Hollander has spearheaded affiliation agreements between Mount Sinai School of Medicine and service providers such as the YAI/NIPD Network. He serves as Chair of the DSM-V Research Planning Agenda for Obsessive Compulsive Behavior Spectrum Disorders. Dr. Hollander is listed in New York magazine’s “Best Doctors”, and “Best Doctors in America”. During his career, Dr. Hollander has published more than 450 scientific reports in the psychiatric field. He has edited 19 books, including Autism Spectrum Disorder (2003), The American Psychiatric Publishing Textbook of Anxiety Disorders (2002), and The Clinical Manual of Impulse Control Disorders (2006). Dr. Hollander also serves as a reviewer for 8 medical journals. Dr. Lehrer is Professor of Psychiatry at the University of Medicine & Dentistry of New Jersey (UMDNJ) Robert Wood Johnson Medical School. He is past President of the Association for Applied Psychophysiology and Biofeedback (AAPB) and currently President of the International Society for the Advancement of Respiratory Psychophysiology (ISARP). Dr. Lehrer has over 100 publications in the fields of psychophysiology, biofeedback, and behavior therapy. He is Co-editor of the widely used text Principles and Practice of Stress Management and the Associate Editor of The International Journal of Stress Management. Dr. Lehrer is one of the leading experts in heart rate biofeedback and is the recipient of grants to study physiological effects of stress and the effects of biofeedback and relaxation strategies for treating a variety of disorders. Dr. McEwen is Alfred E. Mirsky Professor and heads the Harold and Margaret Milliken Hatch Laboratory of Neuroendocrinology at The Rockefeller University in New York City. He is the past President of the International Society of Neuroendocrinology and is currently President of the Society for Neuroscience and a fellow of the American Academy of Arts and Sciences. He is a Fellow of the American Academy of Arts and Sciences and the American Association for the Advancement of Sciences. He is the author of over 600 peer-reviewed articles and one of the most well-known books on stress entitled The End of Stress as We Know It. He is also the co-author of The Hostage Brain. The groundbreaking studies by Dr. McEwen and his research team continue to elucidate the impact of stress on brain structure and neurochemistry in the brain. Dr. Pirozollo is a neuropsychologist and mental training coach. He has held professorships at UCLA, the University of Minnesota, and Baylor College of Medicine, where he was the Chief of the Neuropsychology Service for 15 years. Dr. Pirozzolo was the Mental Skills Coach for the New York Yankees from 1996-2002. He has consulted for the Detroit Tigers and the Texas Rangers. Dr. Pirozzolo was appointed to the National Academy of Science's Committee on Techniques to Enhance Human Performance. This was a group of the world's leading psychologists who were recruited by the National Academy of Sciences and the Army Research Institute, specifically to study methods that individuals and organizations employ to enhance learning under pressurized situations. Dr. Pirozzolo has published 14 books and over 250 scientific and popular articles. His most recent golf books include The Game I Love with golf legend Sam Snead, The Mental Game Pocket Companion, and The Putter's Pocket Companion, all published by Harper Collins. His most recent book is entitled Multiple Intelligence and Leadership, co-authored with scholars Ron Riggio and Susan Murphy. Dr. Rice is a clinical professor at the Western University of Health Sciences, the University of California San Diego School of Medicine and San Diego State University. He founded the San Diego Sports Medicine Center in 1979. In 2001, he founded the Lifewellness Institute in San Diego. He is a Co-founder and past President of the American Medical Society for Sports Medicine, the first organization of primary care sports medicine specialists in the United States. He is a Founder, past President and Fellow of the American Osteopathic Academy of Sports Medicine, a Fellow of the American Academy of Family Physicians, and Fellow of the American College of Sports Medicine. Dr. Rice has served as team physician for many professional, Olympic and college sports teams including the San Diego Chargers (NFL), San Diego Clippers (NBA), San Diego Gulls (IHL), San Diego Sockers (MISL), San Diego Spirit (WUSA), and San Diego State University. He was Medical Director for Oracle BMW Racing for four successive America's Cup sailing campaigns. He has authored numerous texts and medical journal articles in the areas of wellness and sports medicine. Dr. Rosch is President of The American Institute of Stress and Clinical Professor of Medicine and Psychiatry at New York Medical College. Dr. Rosch is one of the pioneers of stress medicine. He had a fellowship at the Institute of Experimental Medicine and Surgery at the University of Montreal with Dr. Hans Selye, who originated the term "stress" as it is currently used. He has co-authored works with Dr. Selye as well as Dr. Flanders Dunbar, who introduced the term "psychosomatic" into American medicine. He is an honorary Vice President of the International Stress Management Association and has served as Chair of its U.S. branch. He has organized and presided over the annual International Congress on Stress since 1988. Dr. Rosch is Editor of Stress Medicine, published by John Wiley & Sons in England, and Associate Editor of The International Journal of Emergency Mental Health and The International Journal of Stress Management. He has served or serves on the editorial board of many publications, including The Journal of Human Stress, International Journal of Psychosomatics, Cardiovascular Reviews and Reports, Comprehensive Therapy, Journal of Human Behavior, and Health Inform; Essential Information on Alternative Health Care. The StressEraser Scientific Advisory Board was formed to provide a forum for feedback and recommendations on current clinical trials, future clinical trials, and scientific collaborations. All board members are independent and some members receive a small honorarium for their contributions. Copyright © 2009 Western Cape Direct, LLC. All rights reserved. Western Cape Direct, LLC is the exclusive factory-direct distributor of the StressEraser® personal biofeedback device. StressEraser®, StressEraser Breathwave® and the StressEraser wave logo® are registered trademarks of Helicor, Inc.
All other trademarks on this web site are the properties of their respective owners.